2018 Update: We still think this was an interesting discussion on what to drink at an office cocktail party — but you may also want to check out our latest (less judgy) discussion on what everyone is drinking in 2018. The question repeats itself often throughout the summer months: What’ll you have? What can I get you? The subject, of course, is alcohol. Whether you’re there for the summer or for the long haul, you still want to make a good impression at parties. If you’ve ever wondered what to drink at an office cocktail party, we’ve got you covered — behold, The Corporette Guide to Drinking. Our 2-second tip: The best kind of drink is the one that is sipped infrequently. In other words, try not to get drunk until the after party. Wine. This is always a safe choice. It may reflect a lack of imagination/decisiveness on your part, however. Wine Spritzer. This says, “Dieter,” loud and clear. It can be helpful if you’re determined to make it to the after-after party, however, because you’re drinking a weak drink that’s already diluted. Beer. Again, always a safe choice, although it may reflect a certain desire to “hang with the boys.” We don’t suggest getting this unless you’re actually at a bar and can choose bottle or draft. Champagne. Party time! Excellent! There is a time and a place for champagne — black tie events, specific celebrations — but in general, champagne can get you drunk far too quickly and leaves the nastiest of hangovers. Also, at mass-catered affairs you’re unlikely to get good champagne, so why bother? Colored drinks. Most colored drinks are, unfortunately, girly drinks. It also shows that you’re a bit high-maintenance (appletini? really? ), especially if the party is at someone’s home or at a bar with limited options. Avoid at all costs. The one exception is the screwdriver: The vitamin C in orange juice is great for energy. 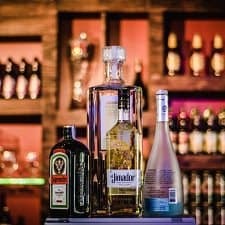 If there is a special drink being offered for the party, however, trying it shows that you’re game and open to new suggestions. Drinks mixed with tonic or club soda. These are great options, provided you’re talking more than drinking. The glasses (generally a lowball or highball glass) are safe, and communicate from afar that you’re not afraid to drink with the group, and that you’ve got a touch of class. Gin and tonic is a great summer drink, as well. If you’re on a diet go for vodka soda with a twist — tastes great and soda lacks the calories that tonic has. Martini. Go classic here, or not at all. Vodka or gin, with an olive or a twist (or possibly an onion). Nothing colored pink, nothing flavored. Sip — do NOT drink. Only get it served “up” if you don’t tend to make a lot of gestures when speaking. Whiskey/Bourbon. Like the martini, a classic drink, and like the gin & tonic, it generally comes in a safe glass. Only drink it if you’re familiar with it, though, and can drink it without wincing. This also tends to have a “drinking with the boys” feeling, but it says you’re up for drinking with the executives/partners, not for drinking with the guys on the baseball team. Rum and Coke. Maybe this is a regional thing, but we say: drinking it is one thing — it’s a dark drink and no one can really tell what you’re drinking. But being overheard ordering it could be embarrassing. After all, isn’t that the choice of most 19-year-olds? Shots. Unacceptable unless the person in charge starts it. Otherwise, save ’em for the afterparty. Diet Coke. This drink says that you’re a party pooper and/or a dieter and/or a bad drunk. (Party foul, anyone?) Still, being suspected of being party foul is better than actually being party foul, so do what you need to do. Current image via Stencil. Original image (2008) via Flickr: photo by DOS82. « Tuesday Poll: Are flip-flops ever acceptable? Great advice. I usually order a drink on my own, privately, and start with a lime and soda with lots of ice, because it looks like a G&T. That way, it looks like an alcoholic drink so you avoid the social minefield of people trying to get you to drink, and by the time you feel like moving on to a real drink you’re two shots more sober than everyone else. Can you tell I’m a lightweight at a firm full of peer pressure? What about a Greyhound or a Cape Cod or some other juice-and-liquor combo? Ha! I missed this last year. Can’t say I ever put that much thought into what I order to drink, but I see your points (vodka soda for me). I think you are right that the rum and coke may be a regional thing. I am in the south and I regularly hear women order rum and diets, but you order it by the brand name and only if the choice of rum/bourbon is good, e.g. Makers and Diet. I admit to being a lightweight, and I don’t drink at work functions at all. I’m with commenter #2, I order club soda on ice with a twist of lemon, and then sip it. Very helpful. Could you give recommendations on appropriate brands of gin, bourbon, scotch and vodka? I never drink them at home so don’t know which brands are expensive, which have the right connotation for a business event, etc. It really annoys me the amount of significance placed on being able to drink. I am on a medication that makes me a total light weight. One drink and I am over the legal limit, no joke. But, I can still hang and have a blast. I just hate the moment of “what can I get for you.” I recently had to go to a function and told the host I would like a water to start because I had come straight from a run (well after showering of course). It was a good excuse (and true) and it bought me time for a round. Then I ordered a beer and made it last a good hour. But seriously, the pressure is insane. I can hold my own when I do drink, I just can’t drive. I guess I don’t see the pressure on whether one boozes or not. As far as ordering a beer goes my only advice is to order a “high end” quality beer – not a keystone. With the exception of the suggestion to avoid shots and drunkenness, this is totally silly. Order whatever you’re comfortable with or have a taste for. Hear that Sheeple? I do not drink but I am not a party-pooper. I usually order for myself and it’s usually an Orange Juice and 7up (it looks like Screwdriver and no pressure from anyone to drink). E – I don’t think the post is tell you not to order what you want or like (except for shots), but just informing you of what others will think when you make your selection. Like it or not, right or wrong, people, particularly those auditioning for a job, get judged on all kinds of little decisions and it is better to at least be aware of how you are being judged even if it doesn’t affect your behavior. There are lots of good reasons someone won’t drink- pregnancy, religious reasons, medication that requires not drinking, recovering alcoholic, doesn’t want to get silly, etc. It doesn’t necessarily say party pooper or bad drunk. At all. Brands to order: Dewars (“DOO-ers”) is a safe bet for scotch–not too fancy, but totally classic. Johnnie Walker is OK, too. Chivas is a bit declasse now. Single malts are great, if and only if you can pronounce them properly. (Glenmorangie rhymes with orange-y and Glenfiddich doesn’t rhyme with quidditch–it ends with a soft K.) Irish whiskey is cool–Bushmill’s or Black Bush. Bourbon–Jack Daniel’s or Knob Creek. Gin: Bombay Sapphire is THE gin, but Hendrick’s, if you’re at a bar, shows some sophistication. and ABSOLUTELY no colored, creative “martinis.” Vodka: Grey Goose is in, but imho, vodka is vodka. No cosmos or mojitos or other “trendy” girly cocktails, unless that is the drink of the party. In the South, it is always OK not to drink. Lots of Baptists. Vodka: If we’re talking about impressions, I’d go with Absolut of Ketel One. I think that Grey Goose and Belvedere both scream “I want expensive Vodka that I get when someone orders bottle service. Problem with ordering a non-alc drink to look like you’re drinking: they usually come in a different glass that gives it away. Anyone that knows anything about the proper glasses to serve in will know right away what you are (or are not) drinking. Asking a bartender or server for a particular glass seems to be far more embarrassing than just fessing up to the drink type. 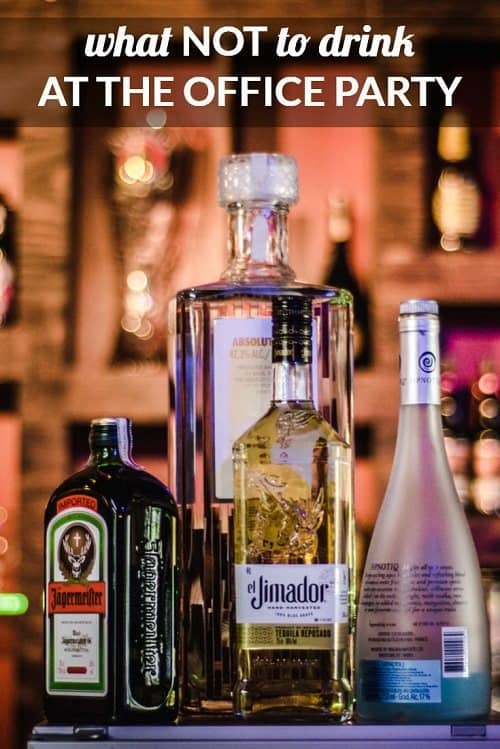 Clear drinks like vodka soda or the fake-out soda with a twist are best for making sure you don’t spill on yourself and end up looking sloppy. Gee, and I thought I should drink what I’m in the mood for–I’m not one to get drunk, and don’t want to pretend that I like it. I am usually a vodka and soda kind of gal when I’m out with friends (I usually call the vodka, so I guess I’m really a Ketel and soda), but I wonder if it looks bad to order hard alcohol at a work function? Does it make you seem like *too* much of a partier? I usually have dry white wine, alternating with tonic or water at 5pm networking thingies with no proper meal. Getting tipsy is easy to avoid that way. If its a proper party, I go with the flow. Some people see any hard drink as ‘alcy’, some people see any overly sweet drinks as ‘teenybopper’ and some see soda as ‘party pooper’. Pff, I would not worry about it too much as long as you don’t draw attention to what you are drinking. What are after parties like at your office? I usually skipped them at my previous job because too many shameless stories circulated, so I want to know if they are generally worthwhile. I didn’t read this blog two years ago, so I thought I would add my thoughts to the mix. I live in the South and Beer is always a good choice, woman or man. I would suggest ordering a slightly upscale beer, but nothing pretentious. Amstel Light and Boulvard Wheat are my two favorites. Wheat beers are good choices, because they are heavier than your light beer and take slightly longer to drink. They also are poured into a glass, which has a nice effect. If beer is not your think, I suggest keep it clear. Like the aforementioned gin and tonic, vodka and soda, or dare I say vodka and sprite (the calories, aghast!). Also, I think a (2) drink max is appropriate for any office happy hour. It shows that you are sociable, but not an alcoholic. Because, NOTHING is worse than being the office drunk. NOTHING!